Peterborough Panthers produced a valiant effort as they predictably bowed out of the SGB Championship KO Cup last night (October 13). The city team found a 28-point deficit too big a mountain to overcome as they prevailed 51-39 on the night against Scunthorpe in a semi-final, second leg at the East of England Arena, but slipped to a 98-82 exit on aggregate. However, their performance should give them plenty of heart ahead of their SGB Championship play-offs semi-final, second leg against Lakeside today (October 14). Skipper Simon Lambert produced another stunning showing when top-scoring with a paid 17-point haul while Emil Grondal racked up 10 to return to form after failing to score last Sunday when Panthers were pipped by Lakeside in the first leg of that play-offs battle. Guests Ricky Wells, Thomas Jorgensen and Carl Wilkinson all contributed well on a night when a miraculous turnaround did look possible for a few moments. They halved their aggregate arrears in the opening six races, but were never able to make further inroads with Scunthorpe eventually sealing their passage into a showpiece against Workington (who did succeed in overturning a 28-point deficit against Wells’ regular club Edinburgh in the other semi recently) later this month with three races to spare. But it was still a fine effort from Panthers (a four-ride blank from Ulrich Ostergaard aside) in what could prove to be their final home meeting of the season - or possibly longer if owner Ged Rathbone doesn’t succeed in finding a buyer after putting the club up for sale last week. “We gave it a real go, but it was not to be in the end,” said high-scoring captain Lambert. “It’s great to be riding so well, but just a shame that my best form has come after injuries have hit us so badly. “But this is not the end of the season for us. We go to Rye House and we know that we only need to pull back two points and there’s no reason why we can’t do it. “I’m so proud to be captain of the club and I’ll be doing all I can to make sure we get through and we’re back at home again in the final whenever that may be. “And I’ll be doing all I can to get Ged to change his mind about selling as well. If that doesn’t happen then hopefully someone out there will come in and take the club on. And there was plenty of good racing last night as Panthers immediately set about eating into their aggregate arrears. Borrowed number one Wells inspired a 4-2 in the opener before Lambert and fellow Lincolnshire man Wilkinson teamed up for a 5-1 in the second contest. But their progress was held up as Ostergaard brought up the rear in heat three before retiring with bike trouble when sitting on a 5-1 with Lambert on the opening lap of heat four. Both of those races ended in 3-3s but Panthers did soon kick on with back-to-back full houses to open up a 14-point cushion on the night. The teams then traded 5-1s before the visitors’ powerful middle-order pairing of Jason Garrity and Jake Allen claimed a 4-2 in heat 10. Lambert, sent out in place of Ostergaard, then triumphed in a rerun 11th contest in which Wilkinson overcame a 15-metre starting handicap to zoom past Stefan Nielsen for third place and earn a 4-2. But that was as good as it got for Panthers. A shared 12th heat (won by Grondal in fine style) effectively clinched Scunthorpe’s final place and a 4-2 for the Scorpions in the next contest put it beyond doubt. The damage was done in the opening leg eight days earlier when Panthers were bashed 59-31 but that didn’t stop them receiving plenty of backing from their fans last night - although arguably the biggest cheer of all came during a post-meeting address from Rathbone when he insisted he will not consider selling the club to former promoter Mick Horton! PANTHERS: Simon Lambert 15+2, Ricky Wells (guest) 12+1, Emil Grondal 10, Thomas Jorgensen (guest) 8+2, Carl Wilkinson (guest) 6+1, Ulrich Ostergaard 0, Rider replacement for Bradley Wilson-Dean. SCUNTHORPE: Jake Allen 11, Steve Worrall 10+1, Jason Garrity 8+2, Stefan Nielsen 4, Gino Manzares 3+2, Kyle Howarth (guest) 3, Danny Phillips 0. Panthers now travel to Rye House today (5pm) for their crunch play-offs clash against Lakeside who won 46-44 at Alwalton in the opening leg last weekend. The meeting was initially scheduled to start at 2pm but has been pushed back three hours due to a bad forecast in Hertfordshire for much of the day. 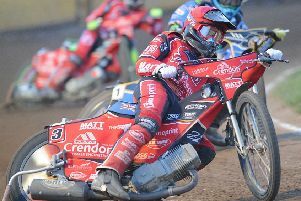 Scunthorpe man Garrity and Newcastle rider Tero Aarnio are Panthers’ chosen guests in the main body of the team while Wilkinson continues at reserve. PETERBOROUGH: Jason Garrity (guest), Emil Grondal, Rider replacement for Bradley Wilson-Dean, Tero Aarnio (guest), Ulrich Ostergaard, Carl Wilkinson (guest), Simon Lambert.